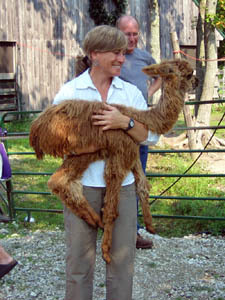 On Saturday Blogless Sharon and I headed to the Parker River Alpaca Farm for a spin in. I’m not sure that words can convey what a fabulous time we had! 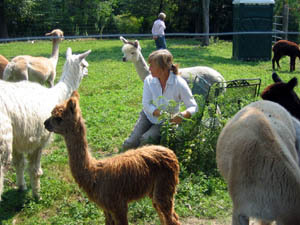 Picture this – a very large fenced in area of alpacas with spinners and their wheels within that enclosed area. Yup, we were amongst the alpacas and it was the grooviest thing ever. I’ve been around alpacas before and I think they are pretty neat. They’re cute and fuzzy and each one is unique both in looks and personality. But there’s also something quietly spiritual about these animals. Maybe it’s their connection to what we do (spinning and knitting, I mean) but I think there’s more to it than that. Sheep are certainly connected to spinning and knitting but sheep don’t feed my soul, if you will. Sheep are cool and all and they can be pretty freakin’ cute, too, but not like alpacas. Maybe I’m just high on hay and fiber but there is something really special about hanging out and spinning among the alpacas. The other terrific thing about Saturday was, of course, hanging out and spinning with friends. I got to see many dear friends and make some new ones, too. We gabbed and chatted and spun together. We shared our lunches and our ideas. We talked about Rhinebeck A LOT and it felt really good to be among my people! Many, many heartfelt thanks go out to Kathy & Tick and Olivia & Dave. Thanks so much for hosting this first spin in at the farm. May there be many, many more! Fabulous recap! I think that I’m still on a post-wheel high. What a great day! You’ve found just the right way to spend a day off, I think. Wow! That looks like lots of fun! I give Kathy about two weeks before she gets a wheel!! How fun!! We have a friend with an alpaca farm…that’s such a great idea. It looks like you all had a good time just by all the smiles! That looks like so much fun, and that photo of her laughing is wonderful. It’s like a guilty pleasure. Thanks for sharing that! You got my Monday off to a good start with a smile. What fun! 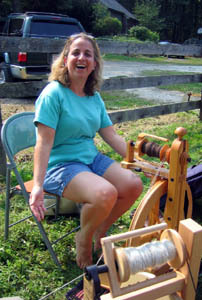 And yes, may there be many more spin ins – only on days that don’t conflict with a fiber festival! I love that last shot of Sharon amongst the Alpacas. Good to see you as always, I’m glad the whole day was as wonderful as my brief glimpse of it made it seem! Sounds awesome! And you had perfect weather for it too! although the alpaca thing. everytime i got see alpacas, they end up showing me their asses. maybe they just don’t like me. It was fun, wasn’t it? Always good to spend time with those who understand. Not just spinners, not just spinners who blog, but spinners who blog and love alpacas and drink wine from poland spring bottles. It was wonderful being amongst the alpacas and I hated to leave. Wine from a water bottle, nibbling on brownies, spinning and all that laughter…the best! Cool what fun! The baby is so cute! Looks like an awesome time and some well-needed and well-deserved R&R. What a great day. I agree – there is something so special about alpacas. Yay! Fun time! I’m glad you weren’t having so much fun that you failed to take pictures. heh My husband is trying to figure out how we can keep alpaca without having to buy a whole farm. I wonder if they’d pass for a large dog in our back yard? Hmmmmmm……. Hey, there I am in pixels! It was indeed a great time. Alpacas are just so amazing. I love it when they hum! Sounds like lots of fun! Now that is a weekend activity I can get down with! Oh man. That looks like a blast. So, what’d ya spin? Sounds like fun! Sheep are just so darned stupid, I can’t imagine spinning amongst them. Alpaca seem like they have a little more going on in their heads, a little more curiousity about life. How cool is that,getting to spin amongst all those alpacas! Glad you had a good time. Wow-what a fantastic day! It looks like you all got along with the critters really well. And Blogless Sharon might have been trying to kidnap a few for herself…. I drank in your wonderful entry like a wanderer in the desert looking for an oasis. What a wonderful day! so how does one get invited to one of these things? it looks like SUCH a lovely day! wish I could have been there! Oooh, so cute. But do they spit like llamas do? sounds like it was a perfect day – the alpacas are such cute beings… I totally see why you are moved by being around them. I wanted to play with the alpacas. Wah. You got to warm up for Rhinebeck. No fair. And pollute the Knitigator, to boot. GREAT job. What a very fun post! I do think that they have cool and peaceful personalities for the most part… are they next on your list? I was at the spin-in as well and I met you there. I came with Julie. She gave me your blog address. It was SO much fun! 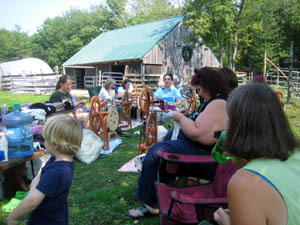 I can’t think of a nicer way to spend my day off – sitting outside with friends, spinning, knitting, and watching the alpacas. I love their large, soft eyes.